AllBusiness law digestDeal digestDispute digestFeaturesInboxIntelligence reportLeaderMarket pulseObituaryPractitioner’s PerspectiveSpotlightVantage pointWhat’s the deal? Voluntary retention route: A halfway measure? What inspired you to become a lawyer? Becoming a lawyer was never something that I dreamt of. After graduating in political science, my dad, who always wanted me to be a professional, was keen I do law. 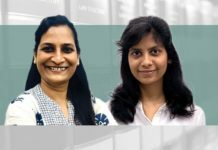 And at that time corporate law had just taken off and it was exciting to think of being part of a law firm, so I applied to study law at Delhi University. 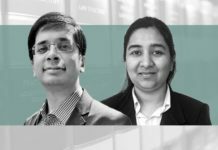 Corporate law culture had become more sophisticated, particularly on account of the increase in deals by multinational companies coming into India. That’s really what drove my enthusiasm. How would you describe the early years of your career? I started my career at Ajay Bahl & Co, now AZB & Partners, and spent five years there. At college, I interned there as well as at J Sagar Associates (JSA) and other firms. When I graduated, I chose AZB because I liked the feel of the firm after working closely with partners Probal Bhaduri and Anil Kasturi. There were so many deals and we were such a small team that we were thrown into everything. We didn’t have to go through layers and levels before seeing a client. It was thrilling, but of course exceptionally tough, with many late nights spent working. It really paid off, because if you can have that kind of perseverance at work, it comes in handy much later on. 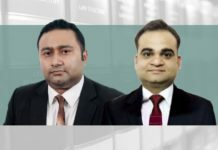 What was the transition like from Ajay Bahl & Co to AZB & Partners? culture would change. The Delhi office had its own culture and we were all very comfortable. We suddenly went from a team of eight or nine to about 40 lawyers. We now had a different set of eyes looking at us and we feared a change in culture. But in reality, it gave us a completely different perspective and an exposure that was great for both firms. We learned a lot from how the Mumbai office worked and vice-versa. We continued to work quite independently, but the merger definitely helped us secure more assignments. And the merger played out very smoothly … we didn’t feel any negative effects of it at all. What prompted you to move to Jones Day? My husband, Nakul Dewan, decided to pursue an LLM in Singapore and at the time I was very hesitant to leave AZB. But in 2007, a lot of foreign law firms were looking at building India practices and hiring Indian lawyers. I always had a desire for international exposure, and we didn’t have kids yet, so it seemed like an opportune time to take the plunge. That’s where I first met Jai [Pathak] as he was doing a lot of the India work. I was always an M&A and private equity lawyer, but ended up being flooded with capital markets matters and worked closely with Manoj Bhargava. I did a lot of IPOs, which I didn’t enjoy much. I was sure that I would return to M&A work at some point because that’s what really challenges my brain. Jai left Jones Day to set up the Asia practice for Gibson Dunn and I moved there after a year. What was it like to work at an international firm after practising in India? I think what helped was that even in Singapore, whether at Jones Day or Gibson Dunn, I worked in offices with no more than 15 people. I was at Gibson Dunn at a time when we were building the practice and it was really challenging because nobody knew the name in India. In fact, Gibson Dunn was not at all known in Asia. So, of course, there was work, but a large element of my job involved strategizing to build an India practice. That was something new – it wasn’t something you could copy and we were competing with firms that charged low fees simply to get a piece of the pie. The quality of my training there was second to none. That’s not to say the quality in India isn’t good, but it’s a combination of things such as how you draft your responses, your understanding of what the client wants, and your ability to provide a response in three sentences rather than three pages. I had to become a quick thinker and a quick responder. At Jones Day and Gibson Dunn, if a client got in touch, you had to give clients a view, rather than present a series of options. Of course, the client decides whether or not to adopt that view. How did Indian clients, who were probably used to receiving four-page drafts, react to the Gibson Dunn or the international law firm model of short, sharp replies? It actually depends on the client’s sophistication. Clients today are smarter – over the years they’ve become savvier at dealing with law firms. They also know the subject matter – the CFO, general counsel and CEO know exactly what they want. We were more expensive, there’s no doubt about it. But when you send short memos, you save hours of an attorney’s time and therefore we saved our clients’ billing hours too. Some of our clients recognized and valued this. It was tough to convince many companies that they were getting a certain quality from us. While I was at Gibson Dunn, there was apprehension on Indian clients choosing international law firms. By the time I left, there was a huge change in the comfort level and perception of international law firms. 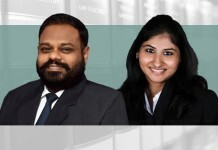 While you were at Gibson Dunn, did you ever discuss your “new” style of working with your peers in India who remained at Indian law firms or companies? What was their perception? It wasn’t just my peers, but also my seniors who wanted to know how things were different at Gibson Dunn, and what worked better. They were extremely positive about taking feedback and many personally wanted to move to a more crisp and concise way of working. They were willing to adapt to client expectations and a style of working which was more efficient. So, the conversations comparing the benefits of practising as we do in India versus internationally have happened many times. There is a lot to learn from both sides. 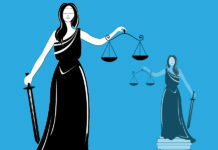 What can international firms learn from Indian lawyers? Indian lawyers are thrown into doing everything when we start working. As a lawyer today, I wouldn’t say, “I can’t do HR, tax, environment law, etc”. You had to do everything that came to your table. We were trained to adapt and to read and interpret every kind of law. At international firms, if you have an HR matter it goes to the HR partner or HR lawyers, and likewise with other areas of law. To some extent that narrows down what you can grow into as you become siloed pretty early on. In my current role, you have to be willing to tackle everything. That was the helpful part of the learning from the Indian perspective and I owe all of that to AZB. The tasks assigned were not based on rank. For example, you could have both a partner and a first year doing a due diligence. The partners never thought they were too senior to work on a particular matter. We were so hungry for the work, we did just about everything that came our way and everyone was involved. Of course, that changed over time because firms are now much larger, but that was an advantage for me at the time. Did that also help break down the hierarchies that sometimes exist between junior and senior lawyers as well as the pigeonholing that often occurs with young lawyers? Absolutely. Ajay Bahl was accessible to each one of us, which wouldn’t be possible today. Getting to work alongside Probal and Anil was also hugely beneficial because of their calibre and quality of work. The kind of bonding I had with them is difficult to come by today. We did every deal together, so today they are my closest friends, and that’s partly because we spent so much time in the data room, or on due diligence, or drafting a document. Now there’s a huge gap between a partner and first, second, or third year associates, which in our time didn’t exist at all. What inspired you to move in-house? I was enjoying private practice very much and had no desire to become an in-house counsel. I don’t think I’ve worked with anyone better than Jai. He was one of the best mentors anyone could have. A lot of what I learned about managing a team and how to think big came from him. My move was driven a lot by IndiGo’s then president Aditya Ghosh, who I had worked with as an intern at JSA in 2000. The opportunity at IndiGo was extremely exciting, but I wondered how I would cope – the company had 17,000 employees when I joined them. What really excited me was Aditya giving me the opportunity to turn around the legal department. They hadn’t had sustained leadership for a while and so I had a chance to learn how to manage people while also learning about the business. The professionalism of the promoters was also appealing. You had advised IndiGo in the past, but how did you get to grips with understanding the industry and business in your current role? Aviation was very new to me. Within a month of joining, I was thrown into the acquisition of ATR turboprop aircraft, so I definitely learned on the job. I had never reviewed nor carried out an aircraft purchase agreement. I sat with the business team to figure out how to structure the purchase; who to buy the aircraft from, how to devise the strategy behind it, drafting the term sheet, and finally seeing the first aircraft land at the airport. That was an exhilarating experience. I had to handle the deal on my own because it was highly confidential. Most of the negotiations happened outside India and I wasn’t permitted to engage any law firms. I only had one person assisting me because we couldn’t even involve our own team. I was very lucky to do that deal because I got to work very closely with the business teams and it really helped me understand the business well. Being a part of the leadership team and executive committee also allows me to appreciate the thought process of the senior management. Every day something new happens at IndiGo. It’s stimulating and keeps you on your toes in a way that I’ve never experienced at a law firm. A lot of in-house practices can become highly templated over time, especially when run by a parent company. At IndiGo, we negotiate every document so that it works for us. There is a huge responsibility that is handed over, which is critical. It is rewarding as a lawyer to have that level of trust. But you have to be committed and willing to rise up to the challenge because it’s a job that requires your mind to be ticking away constantly. What legal and regulatory reforms would you like to see undertaken in the aviation sector in India and for the business as a whole? The aviation sector, like any other sector, depends on a number of economic, financial, legal and regulatory factors, which together impact the sustainability and profitability of businesses and the operations of their stakeholders. It would be good to see an improvement in airport infrastructure including terminals, parking bays, slots, baggage and ground handling, cargo infrastructure, etc. The business as a whole could do with a change in tax on ATF (aviation turbine fuel), permitting slot trading, etc. Could you give us a sense of the current regulatory scenario for transport of domestic and international freight cargo? The Ministry of Civil Aviation, is in the process of finalizing the National Air Cargo Policy (NACP), pursuant to the public consultation with the relevant stakeholders. The objectives of the NACP are to make cargo logistical air operations in India efficient, seamless, and cost-effective. The NACP covers all three categories of air cargo transport: domestic cargo to ensure efficient flow of goods across India; international cargo facilitating all indigenous export and import of goods; and transit international cargo by making India the transit cargo hub of choice to and from other parts of the globe. 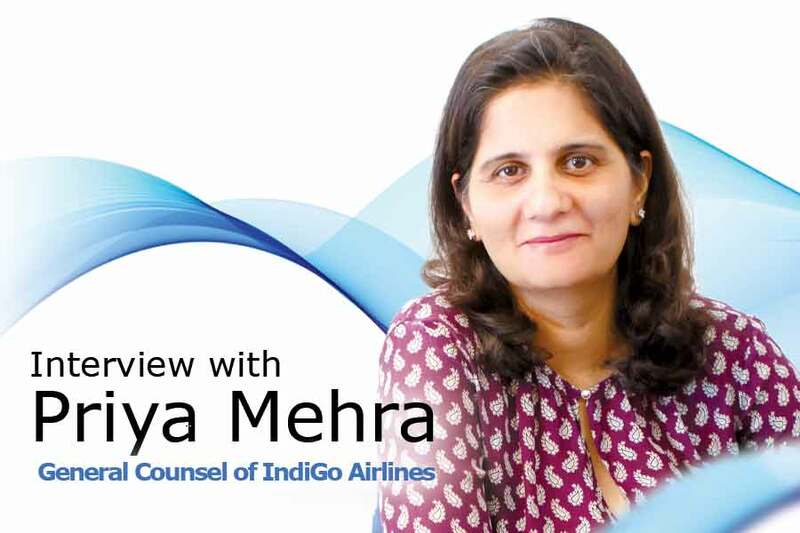 Last year, the Competition Commission of India (CCI) levied a `94.5 million (US$1.3 million) penalty on IndiGo for fixing fuel surcharge rates. What was IndiGo’s reaction to this and what is your team doing to ensure these fines are not incurred in the future? IndiGo has filed a statutory appeal against the CCI order before the National Company Law Appellate Tribunal and the appeal is still pending for adjudication. IndiGo does not indulge in any anti-competitive behaviour. You are now a buyer of legal services. Are you more critical because you’ve been on the inside at law firms? I’d like to think that once you’ve been on the inside, you know exactly what law firms are thinking. I’d rather handle the majority of work in-house. Of course, we do work with counsel, especially on litigation. Our legal team tries to keep totally abreast of the subject on which we’re receiving advice and we only ever seek advice after doing our homework. We try to stay one step ahead of a law firm because this forces them to up their game. The firms we engage know I’ve been on the inside and I understand how things work. As much as I hate to say it, a lot of quality comes with partner involvement. I don’t have any problems with juniors doing the work, but they should be brainstorming this with a partner before coming back to me. I have had experiences where you end up with a very junior person on a call. I’m not coming to the market for that. Aviation is a very niche and specialized area of law. 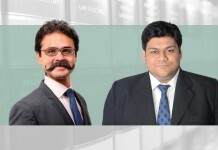 Do you feel there is adequate depth of expertise of this field among India’s law firms? There are few law firms in India that specialize in aviation law and are particularly adept at understanding the finer nuances of the airline business. We have therefore strived to create an in-house legal team with professionals dedicated to several focus areas and disciplines. We use international law firms to assist in our leasing documents since they are mostly governed by English law. How is your in-house team structured? We have 24 lawyers and a compliance and ethics team of four. 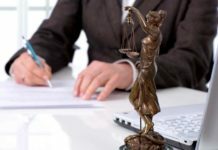 We have four senior lawyers – known as associate general counsel, and also a head of the ethics department, who run the show with a team of young lawyers. 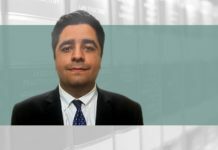 They sit parallel to the legal department and handle a number of verticals: aircraft acquisition and leasing, policy advocacy and regulatory, customer disputes and litigation, commercial and information technology, human resource disputes, and ethics and compliance. Each of these associate general counsel will have three or four departments under them and a bunch of lawyers who work with them. While we encourage people to work across verticals to get exposure, each department needs to have one or two dedicated people who can pick up the phone and address the matter at hand. What I drill into my team is that we have to keep the law firm mentality alive here to prevent complacency. I send out every piece of advice and documentation in the same way as I would at a law firm. I treat our company departments as our clients. How have you managed to balance work and family life? I have young kids, so a lot of my time outside work is spent with them. We explore music and play sport – every day is different because they are five and eight. I have an extremely supportive husband, which is why I am in my current role today. 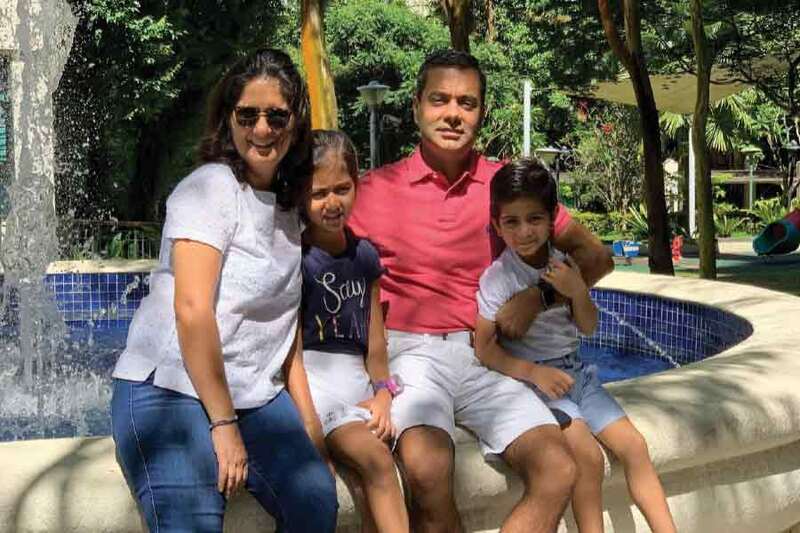 My husband, Nakul, is a litigation lawyer and he also has a demanding career, but we’ve been able to balance it right because we always felt both our careers are equally important. I had my kids while I was at Gibson Dunn and I received a lot of support from Jai. He’s a true believer in giving people space as long as you get your work done. There was no culture of clocking in and out – it was always about the work product and timely delivery. That gave me a sense of comfort. After having my daughter, I completed four months of maternity leave and returned to work. Jai called me over and warned me that the first few days would be very tough, because I’d feel torn as a mother. He told me any time I missed my daughter or felt I was not doing the right thing, I should go home. He believed I’d be with my child and still get my work done. It was true, because if you feel torn you won’t be able to perform well in either place. What do you do when you are not lawyering? What are your hobbies, passions and interests? I love meeting and getting to know people, listening to music and relaxing. I really enjoy music, so I’d spend more time going to concerts. I would love to see Adele – that’s definitely on my list when she is back on stage. The stage presence of an artist is captivating. I’ve seen Dua Lipa, Dire Straits, Air Supply, Maroon 5 and more. I also saw Pitbull when I was eight months pregnant. My husband, who would never otherwise listen to his music, came along because he thought I might have the baby. What an interesting read! Good questions and great answers. you hardly read interviews twice…i did. As artificial intelligence is now a reality, where is the fine ethical line between us and it? 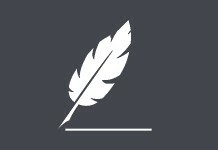 Established in 2006, Vantage Asia is an independent business-to-business publisher based in Hong Kong. 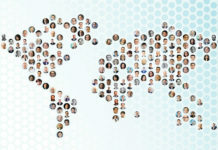 We publish three of the region’s leading legal magazines – Asia Business Law Journal, China Business Law Journal and India Business Law Journal – and produce vantageasia.com, a leading digital resource for in-house counsel, lawyers in private practice and other legal and business professionals with an interest in the Asia-Pacific region. We also publish China Lexicon, a unique fully bilingual hard-back book covering the complexities and nuances of translating legal terms and definitions between English and Chinese. Your data are both precious and dangerous. How many arbitrators do you need in mainland China?